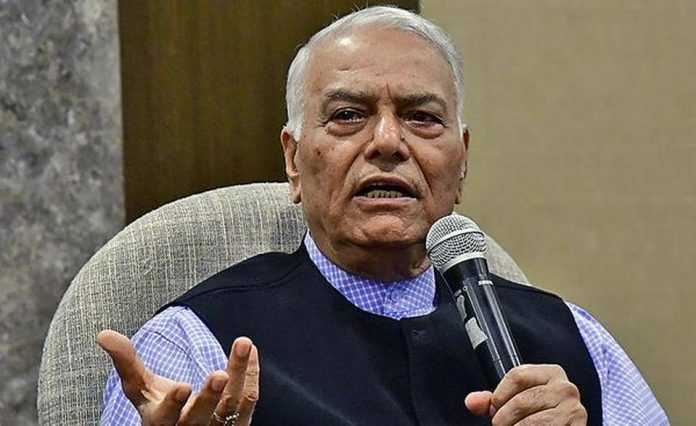 Stating that ‘Modi magic’ was on the wane, former Union Minister and ex-BJP leader Yashwant Sinha on Wednesday said the electorate had expressed their ire and frustration. Mr. Sinha, one of the bitter critics of the Narendra Modi regime, lauded Congress president Rahul Gandhi’s conduct and democratic style of functioning which enabled his party to come back in the Assembly polls. Commenting that Mr. Gandhi knew how to move with everyone, he said: “The BJP says it does not have an alternative for Mr. Modi, but the country will chose its alternative soon …The BJP will now have to think ten times before denigrating Rahul Gandhi as ‘pappu’,” Mr. Sinha said while delivering a lecture at the Pune Patrakar Sangh. He said soon after the results, he had received phone calls from several BJP leaders from Jharkhand, who were secretly happy at their own party’s defeat. Saying that everybody in the BJP was frightened of Mr. Modi, he added that nobody within the party had raised a voice against him [Mr. Modi] and party president Amit Shah despite the party’s spectacular defeat in the key states of Rajasthan, Madhya Pradesh and Chhattisgarh. “For the last four-and-a-half years, Narendra Modi has been deified by sycophants in the party who think he can do no wrong…Modi thinks he can play God and can bypass the council of ministers. But this defeat will put a check on his arrogance,” Mr. Sinha said, stating that it appeared all administrative activities and policy decisions emanated from the Prime Minister’s Office (PMO). The veteran politician, who held the Finance and External Affairs portfolios under the Atal Bihari Vajpayee government (1998-2004), hit out at Mr. Modi’s ‘dictatorship’ and said the BJP’s losses had taken the wind out of its sails. Hitting out at Mr. Modi’s highly authoritarian manner of functioning, Mr. Sinha said that due procedures had been bypassed in the Rafale fighter aircraft deal with the Defence Ministry left in the dark. “The entire nation is being run only by two persons, Mr. Modi and Mr. Shah [BJP president]. The council of ministers is never taken into confidence while implementing any important policy decision,” he said. Similarly, he observed that the Finance Ministry was all but ignored in the momentous decision on demonetisation. “Demonetisation has achieved nothing except wiping out the livelihood of crores of small traders and bringing about widespread unemployment,” he said. Mr. Sinha further commented that nobody in the BJP would get a get a shot at leading the party as long as Mr. Modi and Mr. Shah were in control. “There does not seem to be any likelihood of someone else like Nitin Gadkari leading the party as long as Mr. Modi and Mr. Shah are driving the BJP,” he said.